Simon Birmingham is the Education Minister for Australia. He has recently announced plans to introduce “light-touch assessments’ for Grade 1 students. Click HERE for the article in the Sydney Morning Herald (18 September 2017) for more on this, to bring you into the picture. More assessments. More data. Something has to give. What about giving our kids a chance to come into their own, in their own time. Teachers already collect copious amounts of data every moment of every day. When are we going to stand up and say enough is enough? Schools are feeling more like laboratories in the way of factory farming, mass producing 1 dimensional teaching – what about learning? Our students have just been through a week of testing. One of the external assessments used here is…. Measures of Academic Progress (MAP). We are constantly testing our kids. Analyzing the data and then trying to figure out a way to make sense of it. If a student is a good test-taker, they will make it just fine. 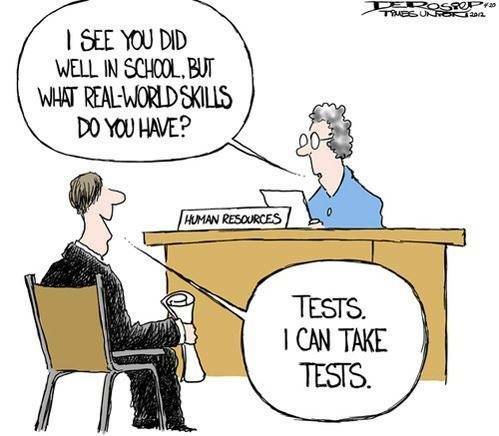 The truth is….. in my opinion at least, where is there room for meaningful planning, best practice and valuing real learning beyond a test or book. We have more data than we know what to do with. Teachers are already on the edge, just keeping up. I believe there is a place for this….. a very small place. We need to slow down a little, back off, and allow our teachers to be creative so they are designing the most powerful learning experiences. Not churning through pages and pages of graphs and numbers and percentages. I’m I the only one that is feeling this frustration? What is your stance on this matter? Let’s not allow a raw number shape and define our kids’ self-esteem and confidence at such an influential age. We need to be pulling good people into the profession. Teaching is such a thrilling and invigorating career path. We have a privileged role in society that is incredibly fulfilling. We need to let good teachers get on with it, and trust that good learning is happening. Invest in that, not more assessments. We are heading down a road of burnt-out and stressed-out teachers. This makes me want to remain in international schools – we are very fortunate to be in our unique situation, where we carefully think about what is important and have a voice in determining our path. I don’t actually think people know when or how we will ever usher in an ‘educational revolution.’ I’ve just felt ripples of good educators, trying to challenge the status quo, in their own way, within their control. Where to from here? Written by Chad Walsh 5 Comments Posted in Change, Education, Learning, Life, Planning, Purposeful Downtime, Reflection	Tagged with Frustrated. Assessments. Tests. Exams. Pressure. Data. Ever since Chad and I came up with the time space education concept, I am hearing people refer to the need for time and space more and more when talking about education, school and life. Don’t get me wrong, I’m not trying to claim responsibility for this trend! I’m just concerned that the issue of having less time and less space is becoming bigger, and so the need for people to refer to it is becoming more widespread. As it says in this clip from “The Gods Must be Crazy”… we don’t know when to stop! Students like Nikita and Kaithe, IB students at Saigon South International School, are referring to the need for people like them to have time and space, to understand their need for time and space and to be able to harness the power of having time and space to improve their learning and the balance of their lives. Teachers – everywhere – are concerned about how fragmented, scheduled and full their daily lives and their students’ daily lives are. Everyone seems to understand that real, deep learning only happens when people are given the time and the space to engage with what they are doing fully. Yet, take a good look at any school’s schedule and you will find a grid that is dedicated to keeping everyone busy, built on the overriding concern that anyone and everyone must have their days cut into small, manageable “segments of time” that can be managed, planned and accounted for. Furthermore, they are built on the premise that learning can not and will not happen unless these grids, and other grids that dictate what must be learned and who will deliver that learning, exist. So caught up in these grids are teachers that – even when there is no expectation from anybody to treat time and learning this way – they continue to do so. The mindset of busyness is so palpable that we can’t help ourselves as we usher kids around, interrupt them, split them up, put them back together, tell them to hurry up, tell them to slow down… We believe we are preparing them for real life, for work. But, strangely, there are almost no workplaces – except perhaps for those we believe we are not preparing our students for – that treat time in this way, that abuse time so routinely! why aren’t students able to go into great depth with their learning? why are so many students unsure what to do when they do have free time? why do we always feel like we’re behind? why are our students, and ourselves, so distracted? why are schools such busy places? why does it feel as though nothing was really achieved some days? why do we often feel dissatisfied with our teaching? I would like to see every school faculty be given the chance to inquire into how time is used in their school – a full, professional inquiry into “busyness” during which they can pull apart the traditional moulds they put time into and think again. The question is… how do we find or create or find the time to do give this issue the attention it deserves?